The turn of the century was particularly harsh for Tata Motors. The recession in the commercial vehicle sector that began in 1998/99 was prolonged and deep. Recovery appeared distant. Tata Motors had close to 60 per cent market share and a large manufacturing capacity. What was worse - the recession cycles in the truck sector were becoming more frequent and extreme. The top management began thinking afresh on ways to deal with the challenge and insulate the company from future downturns. 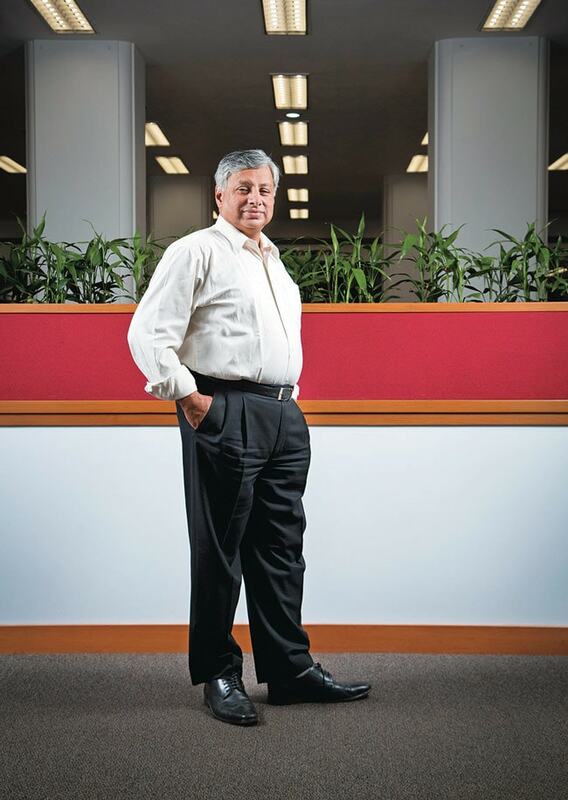 By the end of 2000, Ravi Kant, who was then heading the commercial vehicles business, had set up four cross-functional teams to hit the streets and understand how market and customer needs were evolving. The teams primarily surveyed four segments - intermediate commercial vehicles, light commercial vehicles, medium commercial vehicles and above, and the sub-four-tonne market. Kant handpicked Girish Wagh, a 29-year-old mechanical engineer, to study the sub-four-tonne market, which was dominated by three-wheelers made by Bajaj Auto, Mahindra & Mahindra and Piaggio. At the time, no one in the industry had really thought that four-wheeled trucks could fit into that space. However, Wagh and his team soon changed the perception. In early 2001, Wagh met a Bajaj Minidor owner-driver in Coimbatore and learnt that he was yearning for an affordable four-wheeled truck with more stability, safety, comfort, all-weather protection and one that could carry more load. The best option the person could think of was a light commercial vehicle that could carry around four tonnes, but it was well beyond his means at over Rs 5 lakh. During one such meeting with a Tata 407 truck driver in Ahmedabad, Wagh got the idea of launching a small truck. He says the owner complained about how three-wheeler commercial vehicles were killing his business as they were charging less and transporting goods faster. In short, he wanted a truck half the size of a Tata 407, a 2.25 tonner. The feedback from the market clearly pointed towards a rising demand for small trucks. But the top management at Tata Motors was not so convinced and queries were raised on launching a three-wheeler commercial vehicle instead. Two parallel developments helped Wagh and his team. Tata Motors commissioned a macro projection of the commercial vehicle industry and it threw up interesting findings. The study said the medium commercial vehicle, which was Tata Motors's mainstay, would not be the dominant segment in the future. It said a hub-and-spoke model was emerging in road transportation and the centre of gravity would shift towards heavy and small commercial vehicles. "Tata Motors identified this gap in the market and launched Ace," says Vijay Kakade, Director, Automotive and Transportation Practice, Frost & Sullivan. Around the same time, then chairman Ratan Tata was pushing the group to identify growth opportunities in the domestic market, especially at the bottom of the pyramid. Tata Ace fitted that objective perfectly. In fact, when Wagh made a presentation in March 2001, Tata was very excited. "What was supposed to be a 10-minute presentation went on for 45 minutes. At the end, he [Tata] said we should do the product," says Wagh. Tata's nod sealed the project. "Innovation is difficult in the beginning. There will be a lot of naysayers. Support from top leadership helps in crossing the first threshold," says Wagh, who is now Senior Vice President, Programme Planning and Project Management at Tata Motors. But, despite a strong independent team and solid backing from the top management, the project faced many hurdles. It began with the engine. The team set a certain cost, fuel efficiency and emission parameters for the engine, apart from a level of refinement. To the team's consternation, none was available globally off the shelf. "Without an engine the project was a non-starter. It was then that we decided to develop a two-cylinder version of our four-cylinder Indica engine in-house," says Wagh. It was a bold decision as the market had either a single-cylinder engine or a four-cylinder one. Developing a two-cylinder engine was a challenge. Its initial performance (with respect to noise levels, power, fuel efficiency and emission norms) was better than that of a single-cylinder engine, but much lower than that of a four-cylinder powertrain. The team kept refining the performance and finally by mid-2002 the engine was ready. "This was a critical development as many competitors were forced to drop the idea of a small truck because they did not have a suitable engine and a few were forced to deploy the costlier common-rail-direct-fuel-injection engine," says Wagh. The engine became the USP for Tata Ace. The vehicle's engine costs a third of its competitors, offers optimum performance, including the fuel efficiency of a three-wheeler, while meeting BS II and BS III norms. "Even after seven years of its launch and various competitors, Tata Ace has a 78 per cent market share. It is because of this engine," says Ravi Pisharody, Executive Director, Commercial Vehicles, Tata Motors. The team did not hesitate to test new frontiers in product development. Normally about 60 per cent of a new truck's development (in value terms) is outsourced. For Tata Ace this was increased to 80 per cent. "We looked at innovation as a collaborative effort. We tapped into the knowledge of our suppliers. We gave them the design and cost targets and the suppliers innovated and delivered," says Wagh. "For instance, had we engineered the rear axle it would have been heavier and more costly." Similarly, the team chose to try out a semi monocoque structure for Tata Ace where the body is welded to the frame, which gives weight efficiency to the vehicle. This was something new in the Indian truck sector. The team also - for the first time in Tata Motors's history - adopted a systematic new product introduction process designed by Warwick Manufacturing Group. The entire development process was divided into seven stages and every stage had a gateway (a set of criteria that needs to be met before the project moves to the next stage). "Ace failed to pass the gateway more than once. Once the entire concept of the vehicle had to be reworked majorly. This process helped us to reduce wastage and save time," points out Wagh. The vehicle was ready on time in early 2005 and it met cost targets indexed to inflation. The overall development cost was Rs 200 crore (including the cost of setting up the 30,000-unit capacity in Pune). When Ace was launched in May 2005, it swept the market. "Tata Motors got the first mover advantage. Other manufacturers rushed in seeing the success of Ace but are still not able to compete with it," says Kakade of Frost & Sullivan. Today, every fourth truck sold in India is a Tata Ace. It has created an all-new segment, that of the small light commercial vehicle, forcing competitors to follow in its footsteps. 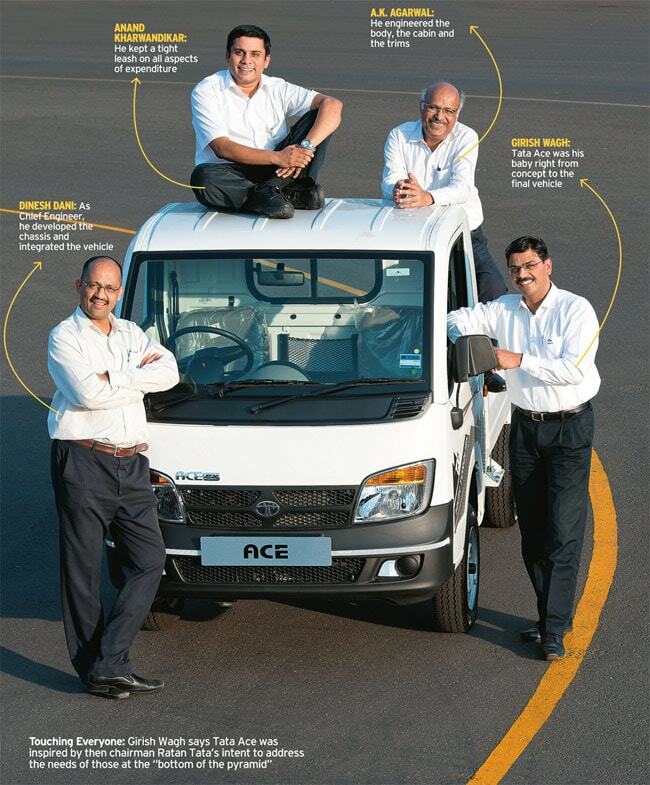 Sales of Ace crossed the one-million mark in November 2012. Its success has helped Tata Motors in many ways. "It offered us tremendous scope for continuing top-line growth," says Pisharody. "Not just that, the company's plan to defend its 60 per cent market share in the industry would not have been possible without Ace." Kakade agrees, adding: "Sales of Tata Ace have been a major factor in the performance of Tata Motors since 2008." The vehicle's demand is relatively free from the state of the economy and has made Tata Motors less vulnerable to economic cycles. "Even during the present downturn, Tata Ace's growth began slowing more than a year after other segments were affected," says Sandeep Kumar, Head - Sales and Marketing, Small Commercial Vehicles and Pick-ups, Tata Motors. Tata Ace accounts for 40 per cent of Tata Motors sales in volume terms. Ratan Tata named the vehicle Ace as he was impressed by its performance during the trials. It has lived up to its name.